•ODT: Nebesky-Wojkowitz, Rene de. (1956). 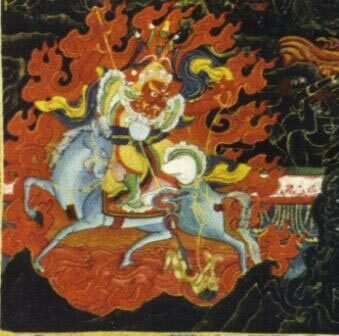 Oracles and demons of Tibet: the cult and iconography of the Tibetan protective deities. Mouton. •WCD: Dung dkar blo bzang ‘phrin las. (2002). Dung dkar tshig mdzod chen mo (White Conch Dictionary). Beijing: Krung go’i bod kyi shes rig dpe skrun khang. •5DL: Ngag-dbang-blo-bzang-rgya-mtsho. (1995). The collected works (gsung ‘bum) of Vth Dalai Lama Ngag-dbang-blo-bzang-rgya-mtsho. Gangtok: Sikkim Research Institute of Tibetology. Praise to Yaksha Khache Marpo, the doctrine’s watchman. Praise to the liberator of the ten enemies. Praise to you and your retinue. These praises are taken from a ritual to Khache Marpo written by the Fifth Dalai Lama (5DL, Volume Da folios 147r-148r). According to the colophon Khache Marpo requested the Fifth Dalai Lama to write this ritual. Khache Marpo is most commonly known as Dorje Shugden’s minister (ODT, 143). Trode Khangsar is Dorje Shugden’s Ashokan Pillar, according to the White Conch Dictionary it was established by the Fifth Dalai Lama himself. Management of Trode Khangsar was entrusted to Riwo Choling monastery, a Gelug monastery in Lhoka. On the same lot of Trode Khangsar was a small shrine called Monkyi Khangsar (smon skyid khang gsar) where Khache Marpo was invoked via oracle (WCD, 1312).